A relatively large 3rd party ecosystem has sprung up around Final Cut Pro X (FCPX). Here are some of the programs, apps and FCPX plugins I really enjoy. Event Manager X: A must have application from the guys at Intelligent Assistance. It allows you to choose which events and projects you load up when you open FCPX. This is easily the FCPX-related app I use most. You can get it here. Sync-N-Link X : This is another awesome app from the guys at Intelligent Assistance. Sync-N-Link X allows you to import an event XML and will automatically sync your second source audio through timecode to your video. The best part is that when you bring your XML back into FCPX, all your synced clips will be titled according to how you originally named them before using Sync-N-Link X. This app pays for itself on the first day due to the amount of time you save, especially if you’re doing a lot of work where they’re jam syncing timecode. It’s available on the App Store here. X2Pro: There’s a blatantly false rumor circulating that you can’t use Pro Tools if you cut in FCPX. In fact, with X2Pro, it’s actually better than before because it uses AAF format, which is an improvement rather than sending .omf’s from FCP7. You can buy them both from the Mac App Store here. Backups for Final Cut Pro: You know how you’re really mad that there’s no auto save vault in FCPX anymore? This fixes that. Get it here. Lumberjack: Yet another Intelligent Assistance App. While it hasn’t been released yet, I have a feeling it’s going to be really useful for people in the reality television and documentary world. It’s all about on-set logging and metadata that you can bring into FCPX. They explain it a lot better than I do, so if you want to know more, check them out here. 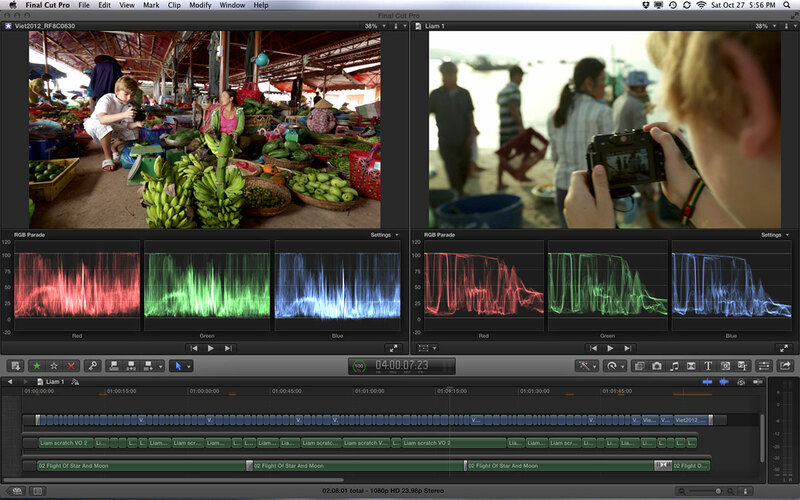 7toX: Got a project in FCP7 that you want to move to FCPX? Use this app. Available here. Xto7: Also from Intelligent Assistance, this app allows you to move back to FCP7 if you need to. Available here. myFiles (Free): A cool little app that will turn your event or project XML into a spreadsheet. Currently, the metadata columns that come through are slightly limited. Did I mention it’s a free app? Side note: I’m hoping someone out there is going to make an app that gives me ALLof my event and project metadata and keywords in spreadsheet form. myFiles is proof that it can’t be too far away. You can get it here. FxFactory (Free): This is the plug-in management app from Noise Industries. Once you get to the plug-ins listed below, you’ll see that many of them come from this app. Why? Because it’s really easy to load, demo, and test out the plug-ins from FxFactory while seeing if they’re useful or not. And if you don’t like a plug-in, it’s really easy to turn it off and not have it affect the ones you plan to use. DaVinci Resolve (Free): If you live in a 1080 HD world, it’s time for you to learn this app. Not only is it pretty much the industry standard for color work, but it’s also FREE if you’re not working in 4k and if you don’t need noise reduction. Not many people know this, but it also works really well with FCPX better than it does with Premiere or Avid. Magic Bullet: Okay, I really wanted this to be higher on the list. I used to love Magic Bullet in FCP7. Supposedly, it works with FCPX; however, I had some difficulties with my trial installer. Not only that, but the whole download process is pretty archaic, topping of the fact that they don’t make it very clear exactly what you’re downloading. Too many packages, too much clutter, and nothing works. So, to the people at Red Giant Software, I would love to be able to use your product, but for some reason you won’t let me. I find this confusing. Please fix this and I’ll write something nicer about you. Pro Tools: As I mentioned above, you actually can get your work into Pro Tools with FCPX. Reaper: A cheaper audio app than Pro Tools (that I actually haven’t used) that, apparently, a lot of people are starting to use with FCPX. If you want to bring your audio into Reaper, you’ll need to download Vordio here. Cantemo Portal: If you’ve got large data management needs and you want a solution that’s going to take advantage of all the metadata you’ve built in FCPX, you’ll want to check these guys out. More integration is coming soon on top of what they’ve built in. The price tag is a little high, but the functionality is good. CatDV: Not many people know this, but CatDV still works with FCPX, and you can use it with your existing FCP7 based libraries. It’s going to give you the option to send something like 14 metadata columns, along with notes and markers into X. To take advantage of it, though, it’d be best to start in CatDV, and then send an XML in FCPX. If you need a lower cost DAM solution that lives outside of FCPX, though, CatDV should still work great for you. Smoke: Here’s another thing many people don’t know, Smoke actually accepts FCPXXML. Now, if I could only export an FCPXXML out of Smoke my ideal workflow of editing in FCPX, coloring in Resolve, and doing VFX in Smoke would become a reality. Someday, I’ll be able to pass my projects freely around to all three and everything will run smoothly together. We’re almost there. Autodesk, if you’re listening, please make this happen. It’s the missing piece and will make it MUCH easier to recommend Smoke for my clients’ workflows. SliceX with Mocha: While the price tag might seem a bit steep, the amount that you can do with this plug-in is staggering. It allows you to have DaVinci’s Power Windows and tracker directly in FCPX—not to mention all of the other masking, blur, and compositing advantages it allows. The fact that it gives you this much functionality directly within your NLE saves you an absurd amount of time over having to conform, go to another program, and then send it back to FCPX for finishing. If you only buy one plug-in ever, this should be this one. It’s worth every cent. You can get SliceX with Mocha here. Tokyo Split Animator: A split screen with no key frames. Enough said. Available from the FxFactory Store here. Tokyo PiPinator: A picture in picture with no key frames. Again, enough said. When used in conjunction with Split Animator, Squid FX Borders (see below), and Compound Clips in FCPX, you can do some pretty amazing stuff really quickly. Available from the FxFactory Store here. Nattress Levels and Curves: If you want Curves in FCPX, you want this. However, I will say that I’d love to get more control over the functionality of this plug-in. Ideally, I’d get access to more than just five points and I’d be able to move them horizontally. It’s really useful as it is, though. Available from the FxFactory Store here. Dashwood Editor Essentials: There is a lot of really useful, random stuff for editors here. The ability to move along the 3D Axis, custom scaling from 4:3 to 16:9, RGBA levels which approximate the advance control primary panel in Apple Color, a White Balance filter (really useful), Luma Levels, countdown leaders, and quick slate generators make this a really great investment for the average pro editor. Available from the FxFactory Store here. UNVEIL from Zynaptiq: This plug-in is pretty awesome and really powerful, but it doesn’t come cheap. While it allows you to do some amazing things with your audio, the purchase price is actually more expensive than FCPX itself. If you need this kind of control over your audio, UNVEIL may be worth the price. You can get more info here. FxFactory Pro: Tons of useful effects, generators, and transitions here, though the price tag is pretty steep. The package and functionality is comprehensive, but the price vs. performance in comparison to some of the other tools listed here isn’t very high. That being said, I really do love the Sharpen range filter. Get it here. SquidFX Borders: I love this package. Why? Well, FCPX has this really annoying bug with its borders effect. You can’t crop a shot while having the borders read the crop settings. Not only does this package give you a lot of cool functionality, but it also gives you a way around the bug. Here’s how: when you put the border on, select “Fit Method – Custom Crop – On Screen Controls.” Then, if you drag on the OSC controls, it’ll change the border size and if you drag onto the picture, it’ll reposition it within the border. You can also do a ton of stuff with SquidFX Borders if used in conjunction with Tokyo Split Animator and PIPinator. Get it here. Lock & Load X: If you need really high quality stabilization that’s better than the built in FCPX filter, you’ll probably want this. You can get it here. SUGARfx Subtitles: This plug-in makes it WAY easier to do subtitles. There are a bunch of different ways to do them in different formats, but I thought the most interesting was using FCPX’s Chapter Markers to automatically create them. It’s a big time saver rather than doing subtitles manually. The tediousness opying, pasting and modifying titles becomes totally unnecessary. Get it here. Ripple Training’s Callouts: If you do a ton of industrial or tutorial type video, you’re going to love this. It has custom arrows, pointers and whole bunch of other really useful things. Available from the FxFactory Store here. Ripple Training’s Timelines: If you do a lot of corporate or presentational work, these customizable transitions are amazing and will save precious time. Available from the FxFactory Store here. Industrial Revolution’s ParticleMetrix ($99) and Volumetrix ($49): Particlemetrix adds some useful particle effects and transitions while Volumetrix is all about glows and light rays. They’re great for fast effects, especially titles that need to look good without spending a ton of time on them. You should use these in conjunction with each other for fast and easy Particle and Title FX. Available from the FxFactory Store here. Dashwood Stereo3D Toolbox: If you need to do 3D within FCPX, you’re probably going to want this. Side note: You can do stereo 3D in Resolve if you need another option. Available from the FxFactory Store here. Luca Sprocket Slip: They have some really high-end transitions. Great for trailers. Available from the FxFactory Storehere. Luca Lo-Fi: Lo-Fi is a customizable and easy to use plug-in that allows you to create vintage-type looks. I don’t like most “look” plug-ins, but I thought this one was cool. Available from the FxFactory Store here. Luca Light Kit: The Light Kit has a number of nice lighting effects. Like most of the Luca packages, it’s useful if you do a lot of music video or trailer editing. Available from the FxFactory Store here. Luca Light Leaks: There are tons of Light Leak packages out there, but you only need to buy one. This particular one gets the job done. I imagine there are others that are just as good, but I enjoy how customizable this one is. Available from the FxFactory Store here. Luca XOverlays: XOverlays has lots of compositing and overlay presets that are cool and easy to manipulate. Available from the FxFactory Store here. Conner Productions: They specialize in making easily customizable FCP X Templates for non-professional editors to use in the post-production process. Available here. Luca Grunge Effects: This one contains a bunch of customizable generators that you can use to composite over your footage for a “grunge-y” look. Grunge Effects is great for music videos, etc. I really like the Luca packages because they avoid the cheese factor. All of their stuff is slick and well designed. Available from the FxFactory Store here. Ripple Tools 1: Color wheels, 8 and 16-point matte, simple 3D and 3D text. Available from the FxFactory Store here. Ripple Tools 2: Brings back the blink filter and scroll text title, cloner, and repeat. I just wish Ripple Tools 1 and 2 were part of the same package. Available from the FxFactory Store here. Stupid Raisins Block/Panel/Shape/Slide/Title Pop: I’m not a big “transitions” guy. However, if you do need them, these are worth checking out. They are highly customizable. Although, honestly, I feel like all of these should come as one package, with fewer overall plug-ins. Available from the FxFactory Store here. There are tons of great free plug-ins too. The best place to start looking for these is on FCP.CO’s free plug-ins forum here. My favorites tend to come from Alex 4D.